I have not done much traveling in my life. When I have, there have been a few times when I took the Greyhound. The trips were not very far as it was only from California to Arizona. Granted, the trips were long enough for me. Even though these trips would take four hours in a car, I ended up being on the bus for seven and a half hours. When you have a couple of kids on the bus with you the trip can sometimes seem a bit longer than what it actually is. Anyways, this review is not about Greyhound, but I had to share my past bus traveling experience first. This review is about Megabus. I had never been aware or even given much thought about any Greyhound competitors out there before. Maybe it is because I am not a frequent traveler - I don't know. All I know is that even as a kid I had heard of Greyhound. I would recognize their buses when I would see them on the freeway and knew that people took them to get to destinations of great distance. 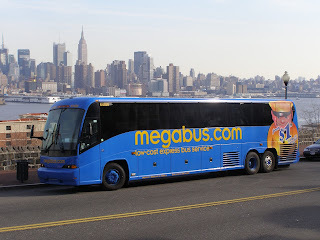 Months ago, my wife and son had to recently take a trip from Los Angeles, Calif., to Las Vegas, Nev. A friend of hers had recommended to her a company called Megabus. This friend had mentioned to her how the prices of this company were much cheaper than Greyhound and made it sound like it was some secret that only experienced travelers knew about. We checked out the website and found out that for my wife and son's trip, it would be cheaper. I cannot recall exactly how much cheaper the round trip was for them. I think the savings added up to about $15. Great! I am always someone who loves saving money! When the day came to drop off my wife and son at the pick up destination, It didn't take me long to notice the difference between between Megabus and Greyhound. At the Greyhound Station in Los Angeles, there is a parking lot that a person can park there car in and go into the station. This is great when you are dropping someone off. I have done it before when dropping off my brother and friends of mine. I comfortable parked in the parking lot and escorted them into the bus station. I was able to hang around with them and say a proper good-bye as they boarded the bus. I must say that I took this kind of convenience for granted because the experience with Megabus was nothing like this. Megabus simply does not have a bus station. Instead, Megabus picks up its passengers on street corners. In the case of my wife and son, they were picked up at the Union Station here in Los Angeles. When they were dropped off in Las Vegas, it was just a street corner. Many people may not think that this is a big deal, but it was a problem for me. There is no parking at the L.A. Union Station. Well, there is parking on the opposite side of where the bus picks up. You have to pay though, and then you will have to go for a good walk. If it is your first time catching a Megabus, you do not even know where the bus is going to pick up passengers so things can be confusing. When we figured out where the bus will be picking up, I was able to get free parking near by. The bad thing is that you only have three minutes or else you will get a ticket from all of the officers around there. I parked, helped my wife and child unload and crossed the street to where they were going to catch the bus. I look, and there is a guy ready to give me a ticket. I run across the street, and he lets me drive away. I then have to continue to drive in circles to see my family board the bus once it arrives. The bus gets there and my wife is yelling at me how she forgot something in the he car. I stop and get out the car to give her what she forgot and am away from the car for about 40 seconds. I turn around and there is a ticket guy writing me a ticket. I quickly give my family a kiss and hug goodbye and run back to my car and just jump in it and drive off. I'm angry because I cannot even see my family off and now I have a freaking ticket. So much for the $15 we saved by taking Megabus instead of Greyhound. I must note that the guy did not have time to really give me a ticket. He tried, but I did not have license plates on my new truck. While he was trying to get the VIN number I had jumped in the car and drive off fast enough so he couldn't get the information. At the time , I was not sure if he got the information or not, but it has been around nine months now so I know he didn't get it. I have told my wife that after this experience, we will never use Megabus again. She agrees that paying a few dollars more for the Greyhound would be the smart choice. The little conveniences that the Greyhound has is well worth it. Things such as having a bus station, public restroom access, security guards on the premises and public telephones (I know, most have cell phones but it's nice knowing that if you don't there is a pay phone) are all very convenient. I also have to add that when you go to the Greyhound you just hand over your ticket to the bus driver and get on the bus. This tickets you will have gotten from printing online when you purchased your ticket(s). With Megabus, you purchase your ticket(s) online the same way, but when you get to where the bus will be picking up the passengers (Union Station in our case) it works a bit different. You have to find some guy who is hanging around and give him your ticket. I might add that this person will not be in a professional uniform or anything. He or she will just look like anyone else out there so you will have no idea what to do. Once you figure it out, you give this person your ticket(s) and they give you a little plastic number that is your seat(s) on the bus. As far as the ride was concerned, my wife said that there is not much of a difference. The comfortableness of the seating is all the same and the time of the trip will be comparably the same. As she stated "A bus s a bus." The only thing that Megabus has over Greyhound is probably the price. When I did some comparisons traveling from point A to point B, Megabus almost always had a cheaper price. Sometimes, the difference will be very little and at other times it will be be a very large difference. You get what you pay for, and if you enjoy convenience, Megabus is not a company that you will ever want to use.